Interstate 696 (Walter P. Reuther Freeway) forms a northerly bypass of Detroit between Interstate 96 at Novi and Interstate 94 at St. Clair Shores. The freeway is mostly urban, traveling below grade from Southfield to Roseville and along a trenched freeway parallel to Eleven Mile Road between Evergreen Road (Exit 11) and Southfield Road (Exit 12). A cut and cover tunnel takes the route below parkland south of Lincoln Drive, where another trenched section leads I-696 to two additional cut and cover tunnels east of Greenfield Road (Exit 13). A symmetrical stack interchange joins Interstate 696 with Interstate 75 at the city of Ferndale. The freeway parallels 10 Mile Road both leading to and away from that exchange, before it shifts northward back to 11 Mile Road ahead of the four-level interchange with Mound Road. I-696 carries eight lanes from M-5 to M-10, six lanes from M-10 (Lodge Freeway) to Greenfield Road (Exit 13), eight lanes again from Exit 13 to M-3 (Gratiot Road) and six lanes to I-94 at St. Clair Shores. Interstate 696 next opened between I-75 at Madison Heights and I-94 at Roseville in 1979. Until 1989, I-696 at Southfield defaulted onto the Governor John Lodge Freeway (U.S. 10). Business Spur I-696 traveled the length of the John C. Lodge Expressway from Smithfield southeast to Downtown Detroit until 1970, when it was replaced by a realignment of U.S. 10. Interstate 696 east, two miles out from the unnumbered directional T interchange with Interstate 94 at the Belanger Street overpass. Photo taken 11/07/09. Gratiot Road, the former alignment of U.S. 25, spans Interstate 696 as the freeway enters the final mile leading to St. Clair Shores. All signs for I-94 were replaced with Clearview font based panels by 2011. Photo taken 11/07/09. Exit 28 joins the adjacent frontage road (11 Mile Road) as it stems east from Interstates 696 and 94 to the St. Clair Shores government complex at Jefferson Avenue. I-696 meanwhile expands to four lanes as it ends. Photo taken 11/07/09. Two lane ramps join Interstate 94 westbound leading back south to Harper Woods and Detroit and eastbound traveling north to Mount Clemmons, Port Huron and Sarnia, Ontario. Photo taken 11/07/09. Interstate 94 westbound one mile north of Interstate 696 (W.P. Reuther Freeway) at Exit 230 with 12 Mile Road. I-696 serves as a bypass of Detroit by passing through Warren, Oak Park and Farmington Hills. 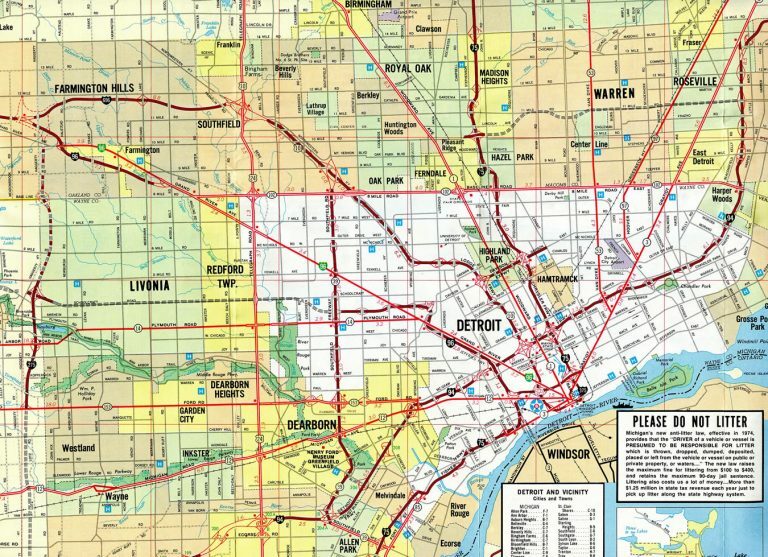 At no point does the freeway enter Wayne County or the City of Detroit. These guides sign were replaced by 2013. Photo taken by John Harmon (01/01/01). An auxiliary lane accompanies I-94 (Edsel Ford Freeway) west from 12 Mile Road to Exit 229 with I-696 west. I-696 provides a direct route to Interstate 96 for motorists headed to Lansing, Grand Rapids and Muskegon. This guide sign was replaced by 2012. Photo taken by John Harmon (01/01/01). The on-ramp from Ten Mile Road adds a fourth eastbound lane to Interstate 94 to the directional T interchange (Exit 229) with Interstate 696 west. Photo taken 11/05/11. Exit 229 veers away from I-94 east to join Interstate 696 west to Warren, Smithfield and I-96 at Novi. A parclo interchange lies within the exchange at I-94, joining both freeways with Eleven Mile Road as it spurs east from the frontage road system of I-696. Photo taken 11/05/11. The initial guide sign for Interstate 696 west (Exit 229) appeared along I-94 east within the diamond interchange at Nine Mile Road (Exit 228). All I-696 signs along I-94 remaining with Highway Gothic font were replaced with Clearview by 2013. Photo taken 11/05/11. Interstate 94 straddles the Roseville and St. Clair Shores city line northward from Ten Mile Road to Twelve Mile Road. Interstate 696 (Walter P. Reuther Freeway) west bisects Roseville to Warren. Photo taken 11/05/11. Exit 229 departs I-94 (Edsel Ford Freeway) east with two lanes for Interstate 696 across the northern Detroit suburbs to Lansing. Photo taken 11/05/11. Interstate 696 travels west with one mainline interchange between U.S. 24 (Telegraph Road) and the junction with Interstates 96 & 275 and M-5. This interchange sequence sign lies 5.25 miles east of the transition to I-96 west. Photo taken by Scott Steeves (11/05/06). Exit 1 departs Interstate 696 (W.P. Reuther Freeway) west in two miles as a two-lane off-ramp for M-5 north to Novi, I-96 east & 275 south to Livonia and M-5 east to Farmington. Photo taken by Scott Steeves (11/05/06). Curving southward, I-696 west separates with Exit 1 in one mile. The mainline reduces to two lanes beyond the Halsted Road overpass as it defaults onto Interstate 96 west through Novi to Lansing. Photo taken by Scott Steeves (11/05/06). M-5 spurs north from Interstates 96, 275 and 696 by the city of Walled Lake to Pontiac Trail. 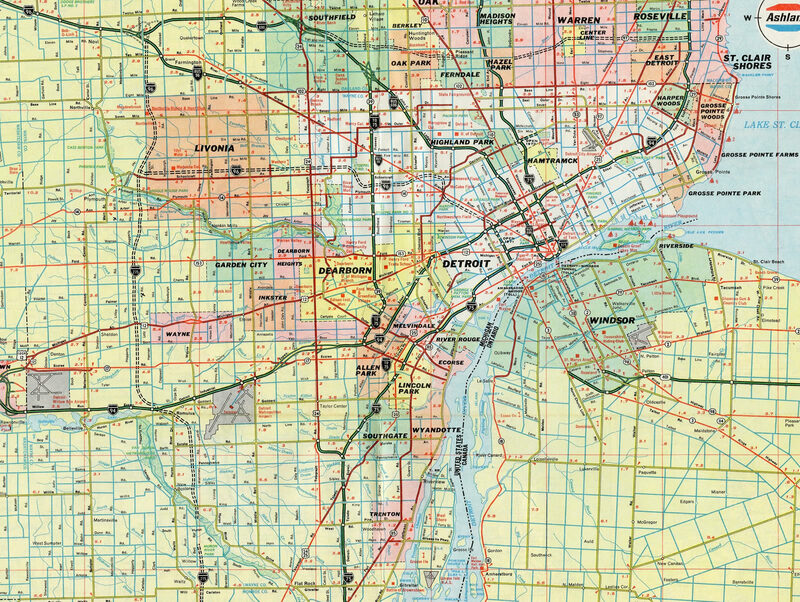 The state trunk highway east joins Grand River Avenue from Farmington to the city of Detroit. Photo taken by Scott Steeves (11/05/06). Traffic partitions for Interstate 96 west to Lansing and I-96 east & 275 south to Livonia and Toledo. I-696 merges onto I-96 west in 1.75 miles. Photo taken by Scott Steeves (11/05/06). An end shield formally marks the conclusion of Interstate 696 west at the gore point with I-96 west. Ramps passing above link the M-5 (Haggerty Connector) freeway with I-96. Photo taken by Frank Gillon, Jr. (05/20/07). Traveling east through the city of Novi, Interstate 96 lowers to cross Walled Lake Branch on the 2.25 mile approach to Interstate 275, I-696 and M-5 (Exit 163). Photo taken 11/06/11. Three lanes continue east from Interstate 96 onto I-696 (Walter P. Reuther Freeway) at Exit 163. 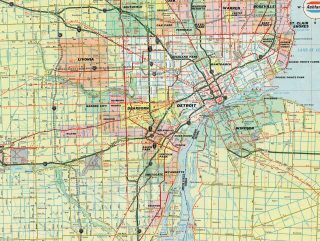 Prior to 1976, I-96 ran east over what is now the M-5 freeway spur leading southeast to Grand River Road. The route was realigned then to overlap with I-275 southbound when it opened between Novi and the Jeffries Freeway at M-14. Photo taken 11/06/11. Nearing the split of I-696 east from I-96 east. Interstate 696 opened initially from M-5 (old I-96) east to the Lodge Freeway (M-10) in 1963. The Lodge Freeway historically carried Business Spur I-696 southeast from Southfield into Detroit until 1970. Photo taken 11/06/11. Interstate 96 east joins the southbound beginning of I-275 from Farmington Hills to Livonia. I-96 turns east there along the Jeffries Freeway to Detroit while I-275 continues south to Romulus and I-75 near Monroe. Photo taken 11/06/11. Interstates 96 west & 275 north approach the large interchange complex (Exit 165) with M-5 east, I-696 (Walter P. Reuther Freeway) east, and M-5 (Haggerty Connector) north. The signs pictured here were replaced by 2011. Photo taken 11/07/09. Interstate 275 north ends as Interstate 96 west separates with a long collector distributor roadway joining the freeway with M-5 east to Farmington and Grand River Avenue, I-696 east to Southfield and Warren and M-5 north to Novi and Walled Lake. Photo taken 11/07/09. The c/d roadway splits with the off-ramp for M-5 east to Grand River Avenue while two lanes progress northward to Interstate 696 east. Grand River Avenue through Farmington was signed as Business Loop I-96 until 1976. Photo taken 11/07/09. Exit 165 splits again quickly before passing over the M-5 mainline for Interstate 696 leading motorists east to Port Huron (via I-94 east) and M-5 north to its terminus tat Pontiac Trail in Commerce Township. Photo taken 11/07/09. M-5 south transitions to M-5 east as the state trunk highway passes over Interstate 696. A slip ramp joins the freeway with I-96 east & 275 south. Photo taken 11/07/09. Two lanes part ways with M-5 south for the beginning of Interstate 275 south. I-275 extends south from I-96 at the M-14 freeway near Plymouth to I-75 north of Monroe. Photo taken 11/07/09. M-5 south combines with an on-ramp from I-696 east to pass under Haggerty Highway and a ramp from I-696 west to I-275 south. Photo taken 11/07/09. Two lanes carry M-5 southeast to Farmington Hills and Farmington while motorists bound for I-696 east loop onto the I-275 northbound off-ramp for the Walter P. Reuther Freeway east. Photo taken 11/07/09. “Detroit freeway’s final link opened.” Toledo Blade, December 15, 1989.